The Gypsy Palace is a quaint and utterly unique detached cottage set in its own mature gardens. Its probably 200+ years old and is steeped in history and folklore. After falling into disrepair some years ago, it was lovingly restored and rebuilt over a period of two years and its now a really wonderful place, full of character and atmosphere. 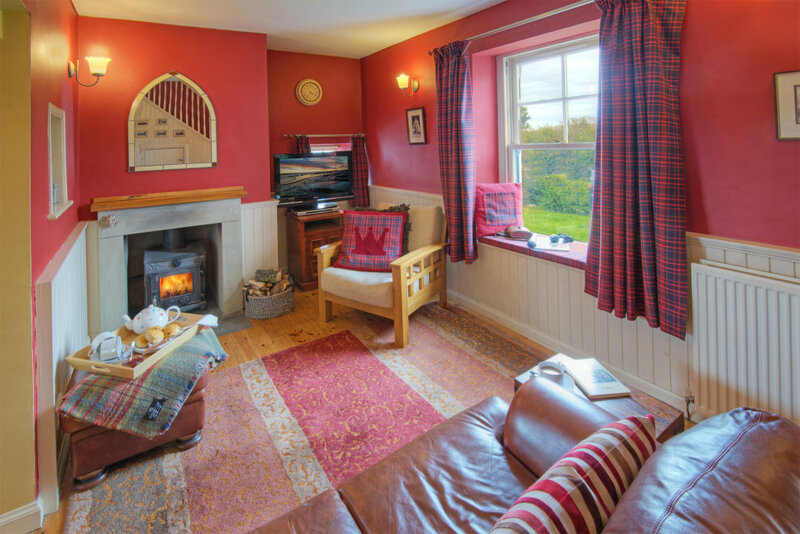 The Palace accommodation consists of a cosy living room with a stone fireplace and log burning stove (though there is of course full central heating too). We have a flat-screen TV along with Freeview and a DVD player along with free unlimited WiFi but we find that most of our guests come here to get away from it all and to unwind and relax. There are wonderful views of the valley which can be enjoyed from the window seat and its a very peaceful place indeed. There are some unusual features too such as the stained glass window between the kitchen and living room, the arched mirror above the fireplace and of course the small stone floored dining area which has a most picturesque cast iron arched feature window with diamond panes, dating from the 19th century. Its all tastefully decorated and furnished with the emphasis on cosiness and comfort while trying to show off a little of the Palace's history. We have collected various old photographs and paintings which reflect the history of the cottage and the gypsy kings and queens who used to live here. 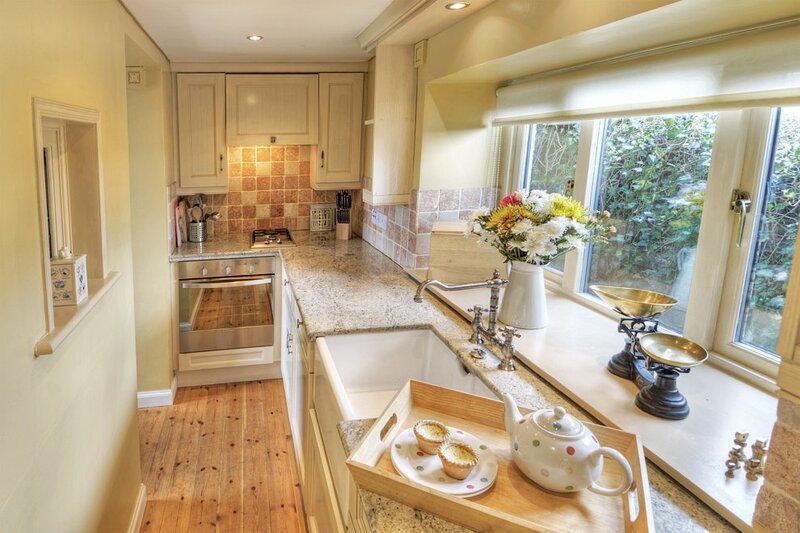 Our kitchen is of a really nice quality and features granite worktops and the original porcelain ‘Belfast’ sink. We have an electric hob and oven along with a microwave and we have tried to equip the kitchen with everything you need for your holiday. The kitchen leads to the stone floored utility room which houses the central heating boiler, dishwasher, washing machine/dryer and fridge. Its a really useful space, great for storing everything from coats and muddy boots to pushchairs and dog-bowls. The stable door leads out to a stone patio area complete with outside furniture. This is our favourite place to sit outside and we often relax out here with a cup of coffee and a cake and simply relax and enjoy the views up the hill. We often catch site of Buzzards gliding overhead or Roe deer out on the hillside. The bathroom has a traditional 3-piece suite with shower and cast iron bath and it has been fully tiled with white Greek marble tiles and has an unusual marmoleum floor design. We have a new traditional style radiator which keeps the place nice and warm. On the way upstairs to the two bedrooms, you pass another arched window containing a stained glass design commemorating King Charles Faa Blythe’s Coronation Crown and a small patch of tartan glass that captures the beautiful afternoon sun. The main bedroom is always bright and warm thanks to the large windows to the rear. The wrought iron double bed has the most comfortable memory foam mattress while the second bedroom (which is accessed from the main bedroom) has a single bed which also houses a second pull-out bed if required. Both bedrooms have the most breathtaking views – south, over the Bowmont Valley and north across to the church, Town Yetholm and the valley beyond. The garden is enclosed and has lawns to the front and side along with a stone patios and cobbled paths. On a warm day, its a great place to relax and enjoy the peace and quiet. At the southwest corner of the garden is the summerhouse; this is actually an old (and very small) railway station waiting room which was rescued many years ago. It features a very comfortable curved bench and of course, to follow the theme of the house, there are coloured leaded windows in its door. The views over the valley are wonderful and the atmosphere peaceful, making it a lovely place to read or relax. The Lodge (our small lockable outhouse) is a handy storage area and I know guests use it to store bikes and pushchairs etc. There is off-street parking for one car. However, you can also park on the road outside quite safely. Its a very quiet road indeed with next to no traffic so safety and security are not an issue. This is perfect walking country - we are right on the Pennine Way. In fact there is a wonderful walk straight from the door of the cottage: you simply turn right, out from the cottage and within a few minutes and as the road climbs, the views get better and better. Within 10 minutes, you really feel as though you are in another world with the most stunning views over the Cheviot Hills. Of course, dogs are welcome to our cottage. Just click on each of the photographs below for more images of Gypsy Palace.